A day after announcing four new all-in-one printers, Epson unveiled another consumer inkjet printer, this one focused on photo printing. The Artisan 50, announced Wednesday, is a single-function printer that lets users print photos, including printing images onto inkjet-printable CDs and DVDs. The Artisan 50 can also print documents and e-mails, Epson said. It prints 38 color pages per minute. At laser-quality speeds, the printer can output five black-and-white and 4.8 color pages per minute. The printer features two-sided printing and individual ink cartridges, allowing users to replace only the color they need. Other features include auto photo correction, red-eye removal, and Epson’s MicroPiezo inkjet technology. 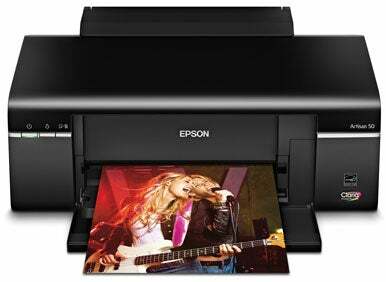 The Artisan 50 costs $100; Epson says the printer will be available in June.